It’s that time again. In this episode of Seinfeld on Marketing, Frank Costanza is talking to his son, George, about how he is selling computers. FRANK: Two months ago, I saw a provocative movie on cable TV. It was called The Net, with that girl from the bus. I did a little reading, and I realize, it wasn’t that far-fetched. GEORGE: Dad, you know what it takes to compete with Microsoft and IBM? FRANK: Yes, I do. That’s why I got a secret weapon… my son. Unfortunately, when your secret weapon is George Costanza, well…I’m sure you know how that turned out. Now, this time around it is Microsoft that has a secret weapon. According to an article in the Wall Street Journal, Microsoft is about to launch a $300 million ad campaign featuring Jerry Seinfeld. The ads are to air starting September 4th under the slogan of “Windows, Not Walls” and will try to combat Apple’s “Mac vs. PC” ads. So what do you think? I’d love to believe that my hero Jerry Seinfeld could turn around a failing Vista and Zune, but I have my doubts. Do you think that Jerry has what it takes? Does any celebrity have that kind of power? If you want to have a truly great brand in the eyes of your customers, forget for a moment about Share of Market and even Share of Wallet. To consumers, these are meaningless measurements that focus on the wrong ideals – size and money. Instead, focus on Share of Expectation. What do I mean? All of us walk around with a set of expectations about what we are looking for and what we’ll find once we get there (wherever there is). 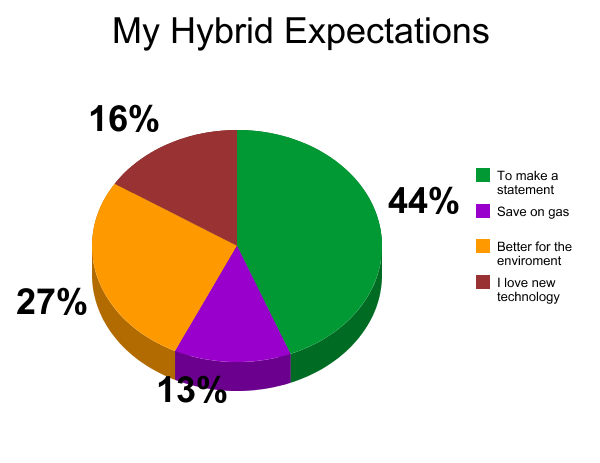 Now if I walked around with these expectations, it would be very wise for a marketer of a hybrid car to focus on my need “to make a statement” (biggest piece of the pie = good, of course). It could be that I want to show others that I care and this is a great way for me to show it. Since in my example I was mainly interested in making a statement, The Prius’ distinctive shape does most of the heavy lifting for me. Its shape is an automatic and powerful story told to anyone with a pair of eyes. But to truly grasp the power of Share of Expectation, you wouldn’t stop at its shape. Toyota could have a digital display in the back window that shows a running total of the pounds of greenhouse gases not in the air because I drive a Prius (over a typical car). The car dealership could give me “green” stickers to hand out to those in the office. Plus there are a million more ideas that could lend to my expectation of making a statement. So the next time the boss brings up Share of Market or Share of Wallet, don’t forget to mention Share of Expectation as well. Is this your Employee of the Month? 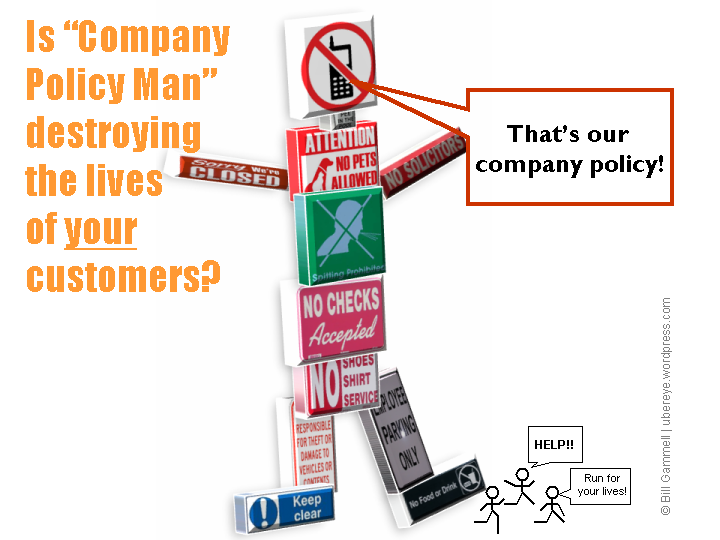 Don’t let Company Policy work overtime at your company, use principles instead. Posting this on your blog. Printing the picture and hanging it next to your desk. Discussing it in your next meeting. Hurry! Before it’s too late. What’s your best “you’re gonna have to…” line? What is the craziest one that you’ve heard? What should we use instead of this line? Should someone be fired for using this line on a customer?